How Does X-Men's Charles Xavier Leave His Own House? It’s not a trick question. Based on various depictions of the Xavier School for Gifted Youngsters, Professor X—a paraplegic mutant telepath with a supposedly genius-level intellect—somehow forgot to add wheelchair ramps to his own home. So we asked artists who have worked on X-Men titles over the years how the franchise’s patriarch leaves his own house. Blueprints for the X-Mansion have been drafted up by fans over the years. Like this one. And this one. What do they have in common? 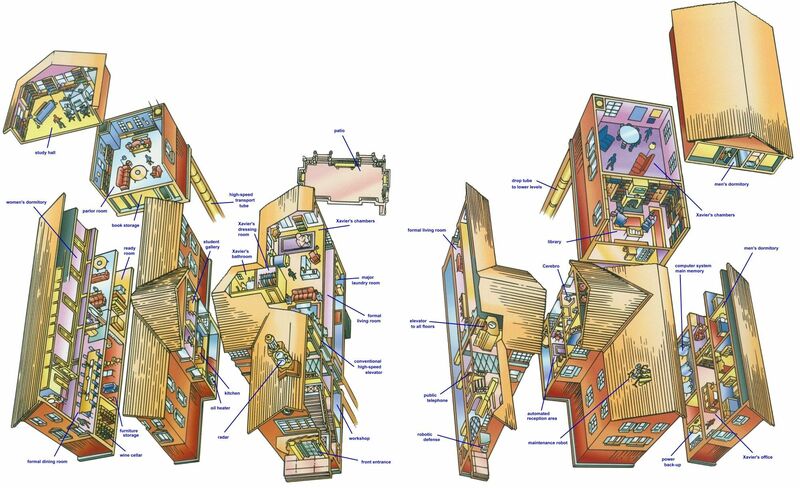 Like comic book renderings of the interior and facade: a whole lot of stairs. Dozens of writers and artists have worked on the X-Men books over the decades and, incredibly, not a single one seemed to consider the need for Xavier to leave his own home. Others simply never considered the possibility. “Personally I never drew a wheel chair ramp,” Chris Bachalo confirmed to Gizmodo over email, but speculated that “perhaps Nightcrawler ‘bamfed’ the Professor in and out of the mansion each day.” There are no shortage of students at Xavier’s school with powers (or normal, human-level strength) that could clear a wheelchair over a flight of stairs. It still makes no sense for a fantastically rich man not to put ramps in his own damn house. Smith’s explanation scans to some degree: there’s not a pressing concern for a comic book artist to draw a panel featuring the humdrum act of Charles exiting the mansion or climbing a flight of stairs. But that concern has come up in other media where motion is more crucial. In The X-Men Films: A Cultural Analysis, author Claudia Bucciferro’s research indicates that director Bryan Singer had Xavier take a serum to fix his paralysis at the expense of his telepathic powers in Days of Future Past, “to allow him to be a more active participant in the plot, to remove wheelchair accessibility as a concern for the writing team.” It’s a strange and troubling assumption on Singer’s part that participation requires the use of all four limbs. It’s stranger still that something as “mundane” as a ramp wouldn’t make an appearance in a franchise which has often functioned as an allegory for social justice, in this case representation of the differently-abled—especially since Xavier’s base of operations isn’t in a fictional city like Gotham or Metropolis. Canonically, the School for Gifted Youngsters is in New York state, a real place that adopted real disability standards two years before the publication of Uncanny X-Men #1 (1963), and which passed Local Law 58—necessitating continuous passage through public buildings and access through main entrances—in 1987. The property has been in Xavier’s family for generations, well before such legislation existed, but over 50-plus years of X-Men comics the mansion has been destroyed and rebuilt countless times—each time without a simple ramp. Insisting that a comic book comply with state legislation is, admittedly, laughable. But so is the possibility that one of the franchise’s most recognizable characters would build a house he could’t readily leave. “So I flipped through [issue #1 of X-Men] and don’t see evidence of any compliance to building codes providing free access through the mansion for disabled [people],” Jim Lee, currently the co-publisher of DC Comics and a veteran X-Men artist told Gizmodo over Twitter DM, “although this def looks like a ramp next to a set of stairs.” He sent along a photo, pointing to an unconvincing section of a panel he drew in 1991. Most of these interpretations don’t feel true to the character or purpose of the famously pacifistic Xavier. Not only does putting the peaceful mutant leader in what amounts to a hovertank read as antithetical to his mission, but his intelligence contrasting his physical frailty is, to my mind, what makes him—or Yoda, for that matter—compelling. In his very first depiction, Xavier isn’t even given mobility. He’s shown confined to an armchair, doted on by his mutant initiates, only to appear in a wheelchair a few pages later. 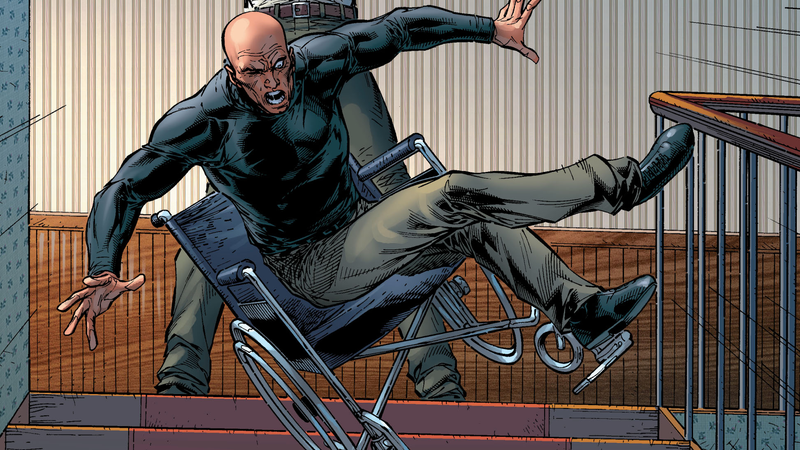 While Lee might have found a way around depicting impediments to Xavier’s mobility, most artists have stuck with fairly conservative wheelchairs and, as mentioned, placed him in a mansion with no ramps and a shitload of staircases—to the point where Charles being thrown down a flight of them by Mister Sinister became a minor meme. It’s a bizarre, long-running oversight which our inquiries and (admittedly non-exhaustive) research appears to confirm. Lee is right, of course. Very few, if any, X-Men comics spent time exploring the bathrooms activities of mutants. But many, many comics explored the futuristic technology hidden within Xavier’s mansion—yet the dozens of wheelchair-accessible ramps these places should have contained are as hidden as those toilets.